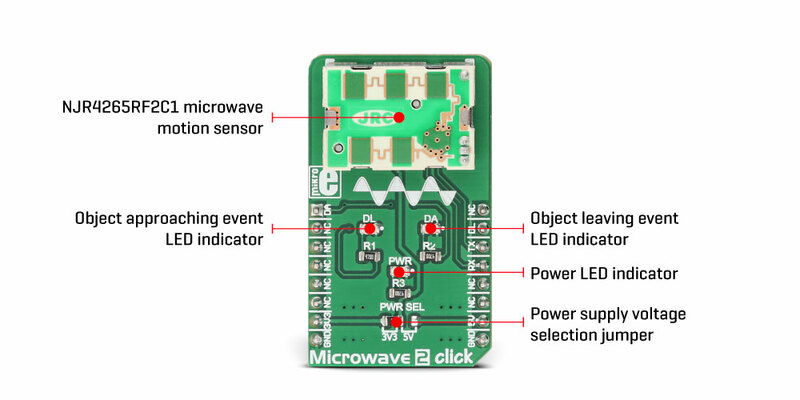 Microwave 2 click uses a UART interface, simplifying the firmware development. 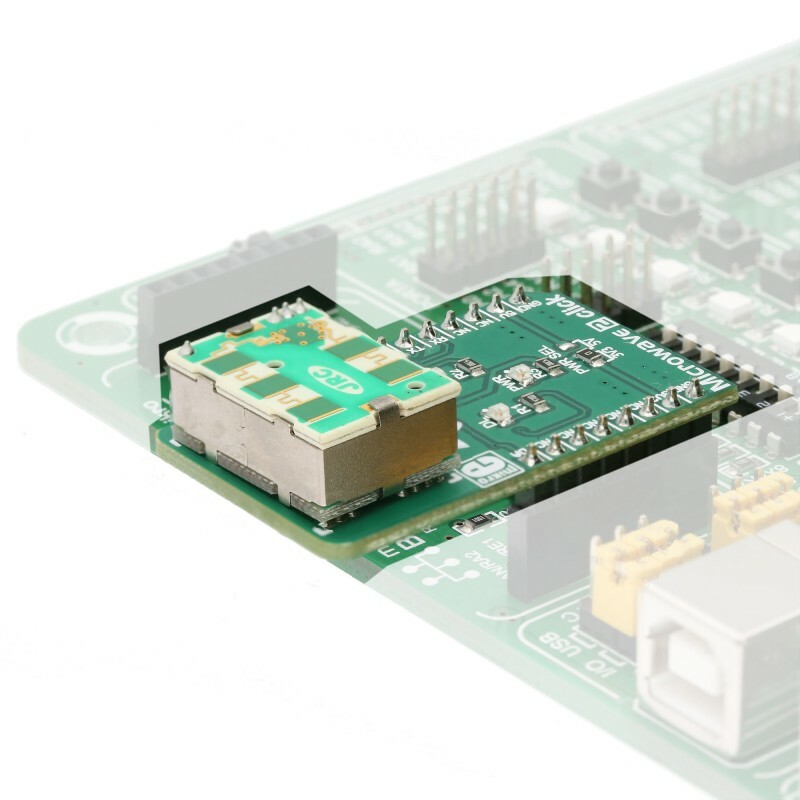 A benefit of having an integrated MCU on the module is that the ability to autonomously work, even without the MCU. 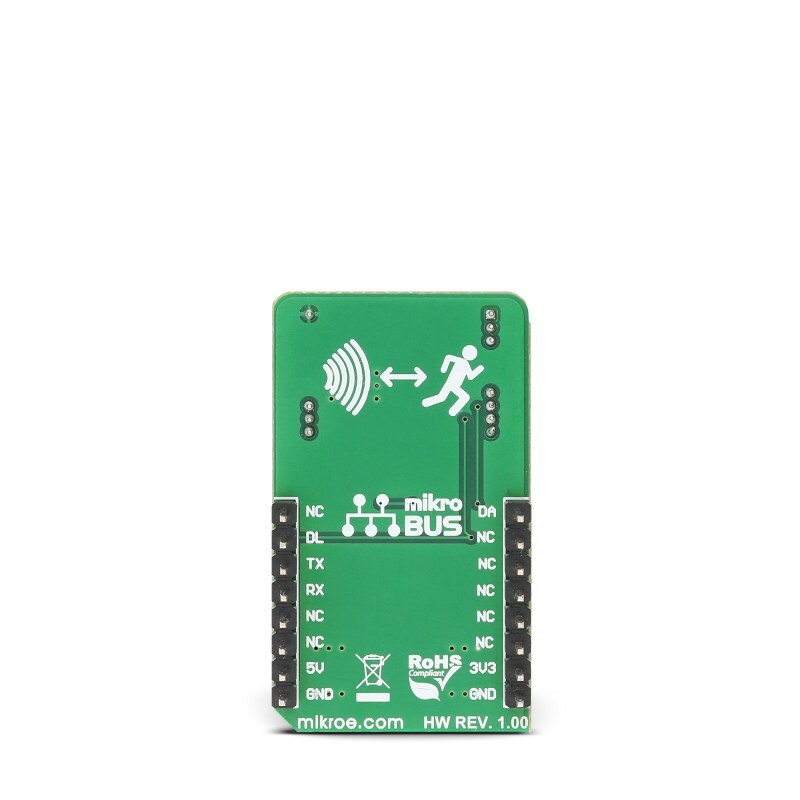 The detected approach or leave event can be signalized either on two differently colored LEDs or via the PINs, routed to the mikroBUS™. However, to use some advanced features, set detection and threshold parameters, operating modes, and other configuration options, the MCU is necessary. Microwave 2 click is an ideal solution for building safety and security applications, entrance and exit management applications, and other applications that rely on a reliable moving object detection. 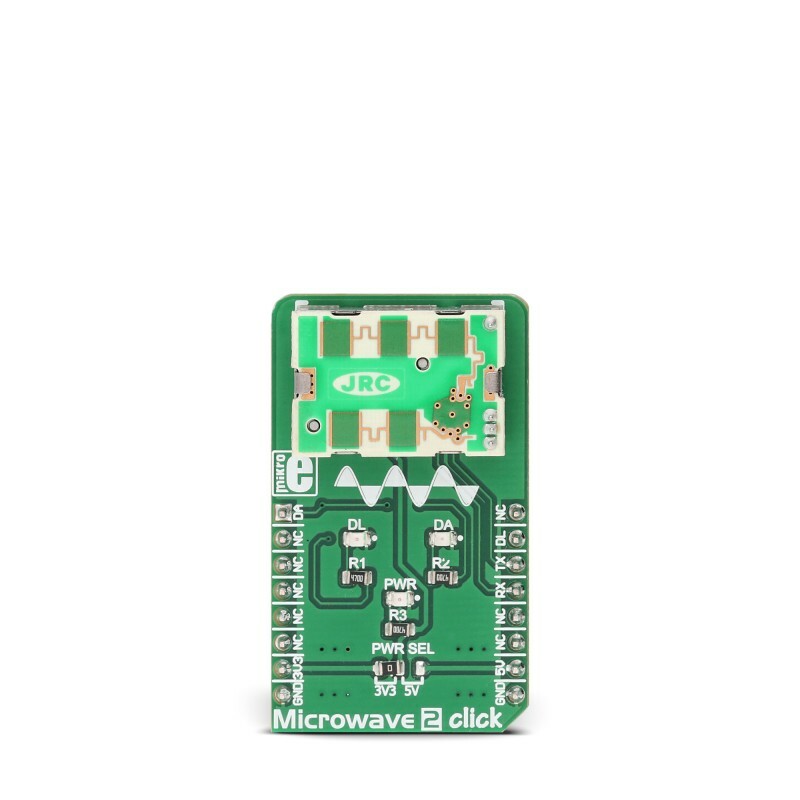 The Microwave 2 click can detect movement by utilizing the NJR4265RF2C1, an intelligent 24GHz microwave motion sensor, from JRC. The onboard microwave motion sensor is based on the Doppler effect. It transmits waves and picks them back as they get reflected from a moving object. According to Doppler effect principle, the movement of an object relative to the position of the listener (sensor in this case), causes the reflected waves to increase their frequency when the object approaches, or decrease their frequency as the object moves away (leaves). Comparing the reflected waves with the base frequency at which the waves are transmitted can reveal the object movement properties. The integrated MCU of the NJR4265RF2C1 module processes the signal reduces the noise and enhances the useful signal, allowing reliable detection and steady sensing of the movement. It then makes a movement direction decision, based on the collected data and signals it back to the host MCU. Two LEDs, labeled as DL (green) and DA (yellow) are routed to the dedicated module pins, labeled as DETECT APPROACHING and DETECT LEAVING. These pins will signal the corresponding events when they are detected by the sensor. The pins are also routed to the mikroBUS™ AN and INT pins respectively labeled as DA and DL on the Click board™. This way, the movement detection events can be signaled to the host MCU, too. The NJR4265RF2C1 module is able to sense moving objects up to 10m in front of the sensor. The detection cone is about ±35° in respect to the central perpendicular axis of the sensor. The object motion speed should be in the range between 0.25 m/s to 1 m/s. The frequency stability of the emitted waves is in the range of 1MHz below, and up to the center frequency of 24.15 to 24.25 GHz, over the temperature range from -20 °C to +60 °C, allowing steady and accurate detection in various conditions. Wave reflections caused by random objects like leaves, air movement, insects, and other similar objects, is suppressed by the on-chip integrated MCU, increasing the target object detection reliability. However, due to its nature, the noise suppression algorithm limits the detectable object speed and size, which sometimes can be undesirable. Having in mind these limitations, the module is best used in applications where larger, slow-moving objects detection is required, such as the pedestrian movement applications, human or animal detection applications, and similar. 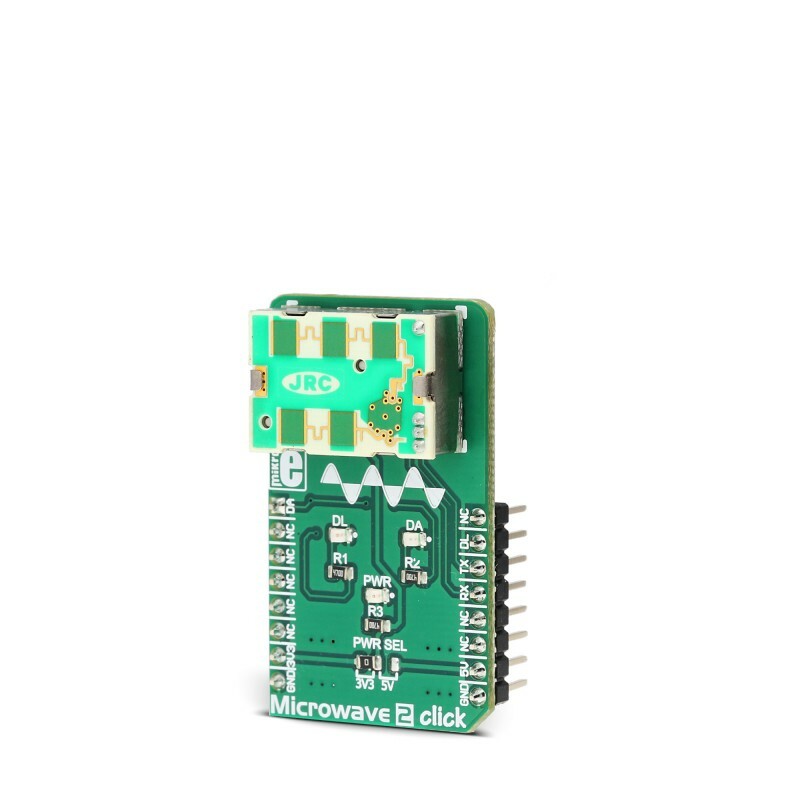 The host MCU can communicate with the Microwave 2 click using the UART interface. The NJR4265RF2C1 module has its UART pins routed to the RX and TX pins of the mikroBUS™. The UART communication parameters are fixed to 9600 bps, 8 data bits, no parity, and one stop bit (9600, 8, N, 1). The MCU can use the UART commands to set the detection thresholds, set the sensor mode, perform acquisition of the detection results and other sensor data. The NJR4265RF2C1 module datasheet offers a list of UART commands, with the detailed explanation of each. However, Microwave 2 click is supplied with the library compatible with all the MikroE compilers, offering a set of functions for simplified control and rapid development of custom applications. Microwave 2 click can be interfaced with both 3.3V and 5V MCUs. To select the appropriate operating voltage of the module, the SMD jumper labeled as the PWR SEL can be moved to the desired voltage position, clearly labeled underneath the jumper itself. This table shows how the pinout on Microwave 2 Click corresponds to the pinout on the mikroBUS™ socket (the latter shown in the two middle columns). We provide a library for the Microwave 2 Click on our LibStock page, as well as a demo application (example), developed using MikroElektronika compilers. The demo can run on all the main MikroElektronika development boards. This library provides generic functions for communication with the click board. uint8_t microwave2_readByte(); - Function for reading a byte of data from the serial port. uint8_t microwave2_byteReady(); - Function for testing if a byte has been received from the click board. void microwave2_uartHandler(uint8_t *packegBuffer, uint8_t rData); - Handler function for byte's received from the click board. uint8_t microwave2_checkTrafic(); - Function will give different return values depending on the data handled in the handler function. System Initialization - Initializes GPIO and UART structures. Application Initialization - Initializes the click board for communication. Application Task - Data sen't from the click board is captured and different actions are applied.